Six health benefits of chocolate explained. We don’t think you ever need an excuse to enjoy a good bar (or slab, or slice) of your favourite chocolate treat. If you’re feeling a bit guilty, though, here are the answers to six common health-related chocolate questions. While you can’t exactly trade in your fruits and veg for a fondue, it turns out chocolate isn’t always as bad for us as we think! 1. Is all chocolate bad for me? Not at all. While many people consider chocolate to be a forbidden indulgence that does more harm than good, many studies have found that consuming a small amount of good-quality dark chocolate with a high cocoa content every day can benefit your health. If your chocolate of choice is high-sugar and high-fat confectionary, trying weaning yourself onto the good stuff to feel the benefits. 2. Does chocolate contain antioxidants? Yes! Chocolate is particularly high in antioxidant chemicals called flavanols. These help protect against free radicals, which are linked to cell damage. Regular intake of antioxidants has been shown to be particularly helpful for lowering blood pressure and preventing heart disease. 3. Can chocolate fight cancer? Chocolate certainly isn’t a cure for cancer, but recent research has indicated that compounds present in chocolate could reduce the number of aberrant cells that are linked to colon cancer. Other studies have indicated that chemicals present in chocolate may play a role in helping to prevent some forms of cancer. 4. Does chocolate make you feel good? Absolutely. Consuming chocolate can replicate the feeling of well-being we experience when falling in love. Theobromine, along with other chemicals found in chocolate, has been shown to release endorphins – pleasure-giving chemicals! 5. Is chocolate bad for my teeth? Not exactly. Contrary to what you might think, in fact, chocolate could actually be good for your teeth. Recent research by Tulane University in Louisiana has shown that the theobromine found in chocolate is even better at strengthening teeth than fluoride. Unfortunately, the large quantities of sugar added to most chocolate can have quite the opposite effect. 6. 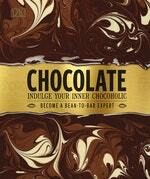 Can you really become addicted to chocolate – a true “chocoholic”? Cocoa beans contain several chemicals that are associated with enhancing our sense of well-being – tryptophan, anandamide, and phenylethylamine are known to have a positive impact on mood. However, the quantities in a single bar are so small that the chances of becoming physiologically addicted to chocolate are slim. So there you have it! Far from being the villainous junk food it’s often made out to be, chocolate can have some surprising health benefits when consumed responsibly. Hungry for more? We don’t blame you! Chocolate is a decadent visual exploration of the world's favourite indulgence, from its origins to tasting, techniques, and recipes, so every chocoholic can really appreciate every mouthful. Find out how to identify quality when buying, taste like a pro, or make your own chocolate at home and experiment with different flavour combinations. Take the leap from chocoholic to chocolatier with the help of more than 20 step-by-step recipes for truffles, fondant, cake, ice cream, and more.